Hundreds of people have attended the funeral for the 19-year old Tony Robinson Jr. , an unarmed black teen shot dead by police officer in Madison, Wisconsin. Family of the victim asked the mourners to leave social and political concerns at the door. About 1,600 people have gathered near Wisconsin high school field house to pay tribute to Tony Robinson, also known as Terrell, Reuters reported. According to local news outlets the funeral drew about 1,000 mourners. 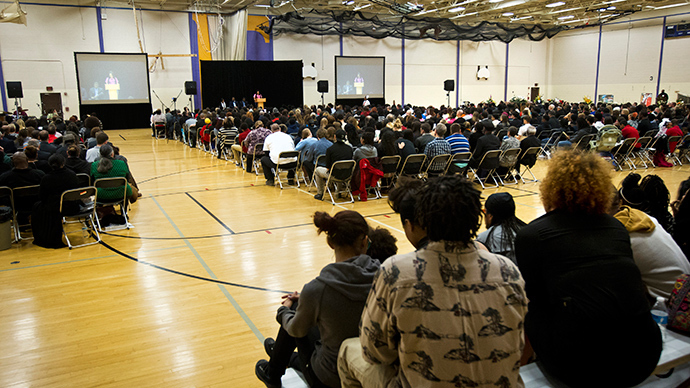 People were heading to the school’s secondary gym where the screen showed the moments from Robinson’s life. "Too many of our children are dying before their time," Rev. David Hart told mourners. "We must not accept that narrative that has become all too common." The family of the victim said the memorial was not about politics. "We want this to be about a celebration of Terrell/Tony's life and not necessarily about the issues it raises," Robinson's uncle, Turin Cater told WITI TV station. A few people arrived wearing T-shirts saying "Black Lives Matter," but soon they were politely asked to put them away at the teen’s family's request. The funeral ceremony started with selected songs and readings. Some of the participants were overcome with emotions to speak. The song “Gone Too Soon” was heard at the service. “Tony is not a victim. He’s our own martyr, a champion of change. And for you I will always stand,” Robinson’s aunt Lorien Carter said. The incident happened March 6, when officer Matt Kenny, a 12-year veteran of the Madison Police Department, was responding to the reports of traffic interference. Kenny followed Robinson into an apartment building and forced his way in because he heard a disturbance. In an ensuing scuffle, Robinson was injured by gunfire, according to police. Kenny administered first aid, as did other officers who arrived at the scene, police said. Nevertheless, Robinson, a 2014 graduate of Sun Prairie High School, died of his wounds at a local hospital. Kenny, who is now on administrative leave with pay during the state’s investigation, was also involved in a fatal 2007 shooting that was deemed a “suicide-by-cop” situation, according to Madison’s police chief. According to 2011-2012 arrest statistics reported by USA Today, Madison actually had worse racial disparity in arrests than Ferguson, Missouri, where police shot 18-year-old Michael Brown last summer. The Ferguson shooting brought into focus the alarming trend of African-American youths being killed by police.